Sick death metal through which the dead rise from the graves. This is what CORPSESSED from Finland, the worshippers of Lovecraft and the occult sciences, will bring to Trutnov's boards. Do not expect some shiny death metal, calm and full of melodies. Death, destruction and a very deadly atmosphere which will give you the creeps spread from the stage of CORPSESSED and you will feel like wading through an impenetrable swamp that is gradually absorbing you and you are step by step closer and closer to the kiss of death. CORPSESSED do not only serve pure death metal to their zombie fans but they add various ingredients to it. The musicians also play black and doom metal in addition to this band and everybody contributes a part of their black soul to the common work. This is death!!! 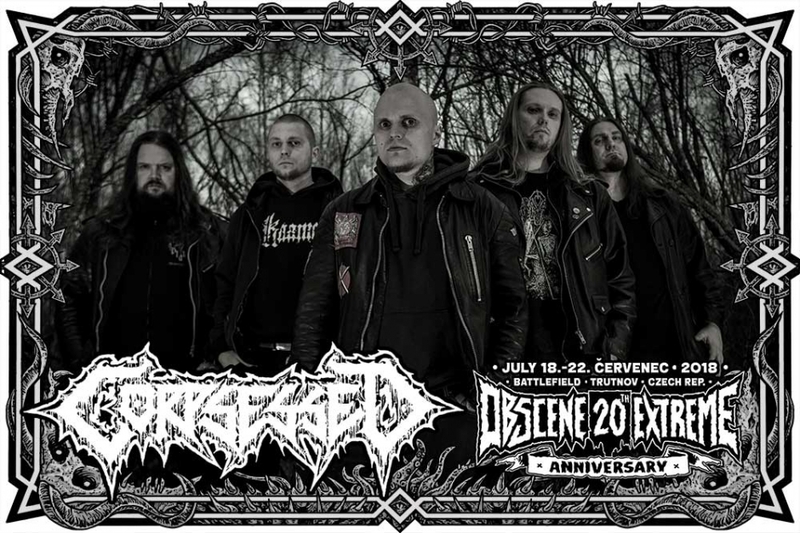 Corpsessed was spawned from putrescent slime in 2007 at the rotting houses of delta-area Järvenpää, Finland. The 5-piece band started honing their abysmal Death Metal tunes and officially released their first EP titled "The Dagger & The Chalice" on CD by Dark Descent Records (USA) and on vinyl by Me Saco Un Ojo (UK) in 2011. Corpsessed's debut full-length album titled "Abysmal Thresholds" was released in the beginning of 2014, and has strengthened the band as one of the current torch bearers of Finnish Death Metal. Currently the band is working on their second, yet unnamed, full-length, which will be released later in the year 2018. The band is known for their dark brand of death metal that harks back to the old days of early 90s and has received high praise for their hard-hitting and suffocating live shows, touring Europe with Cruciamentum in 2015 and appearing in such festivals as Netherlands Death Fest (Nl), Morbid Catacombs Fest (Ger), Tuska (Fin), SteelFest (Fin), KillTown DeathFest (Den) and NRW DeathFest (Ger) throughout the past years.